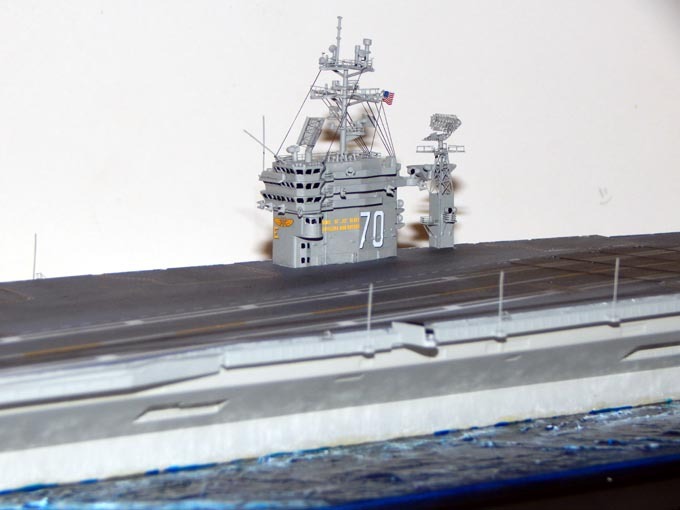 I am doing a commissioned build of the USS Carl Vinson for a gentleman whose son is currently serving aboard the ship. 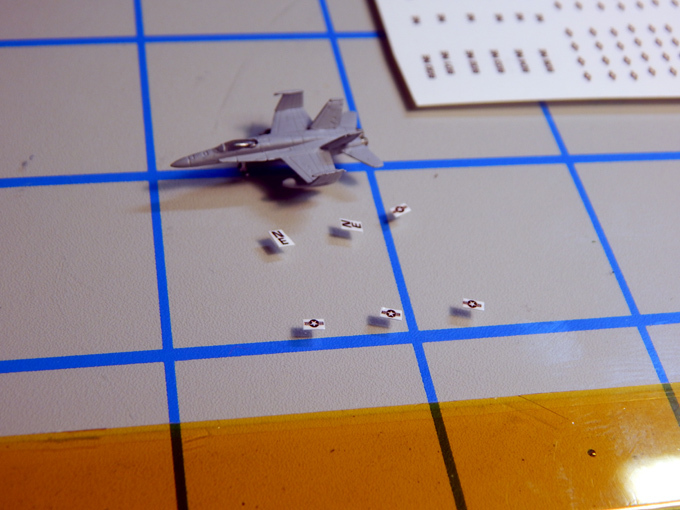 I am using Italeri’s 1/720 scale model and will be using the Gold Medal Models photo etch set and Trumpeter aircraft. 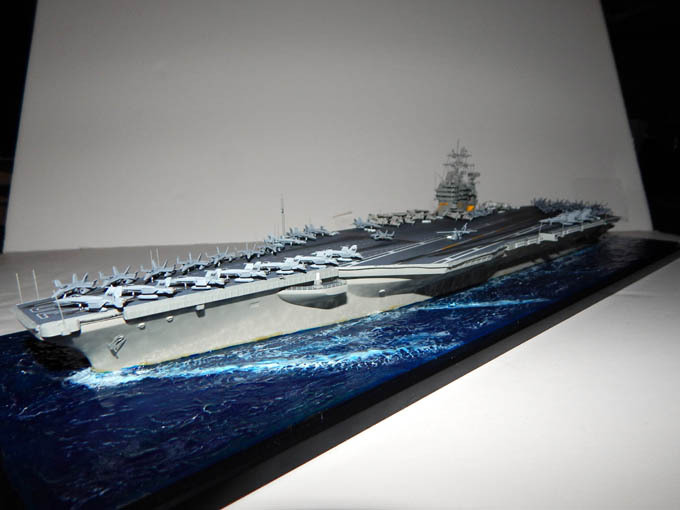 The ship will be mounted in a display case depicting it “At sea”. 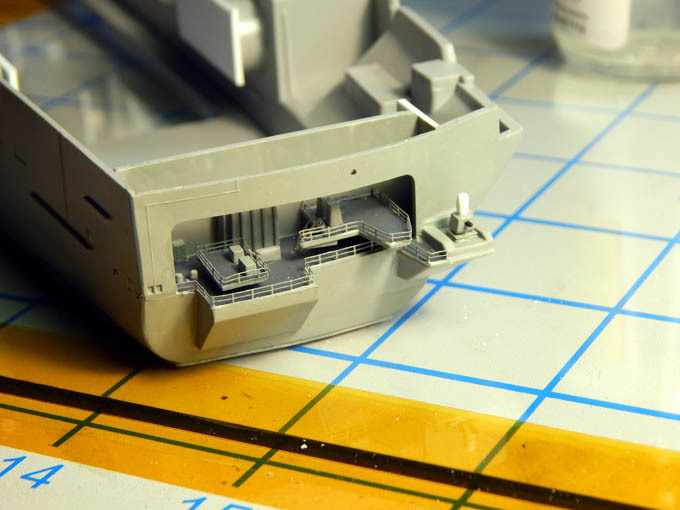 Starting with the hull, The hangar bay doorways in the kit looked too plain. I cut the entryways to the correct depth and added scratch built doors. Next I started detailing the fantail. Some filling was required for the deck to hull fit. The platforms were then detailed with railings and ladders. 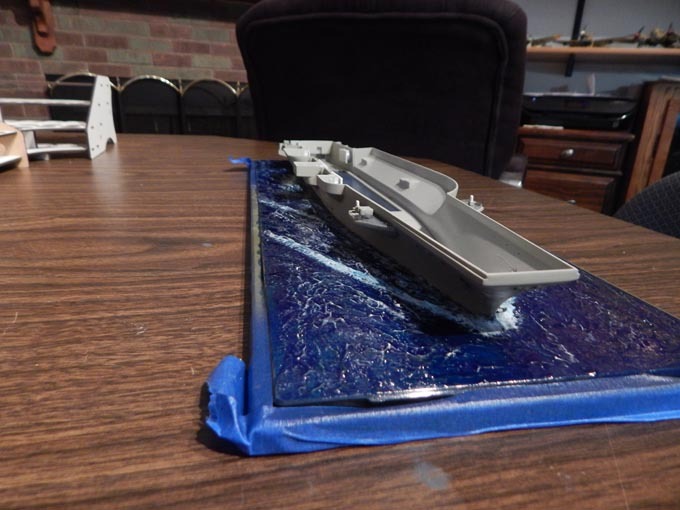 Continuing the work on the hull of the 1/720 Italeri USS Carl Vinson. The kit had the anchors molded on and none of the anchor or mooring ports. 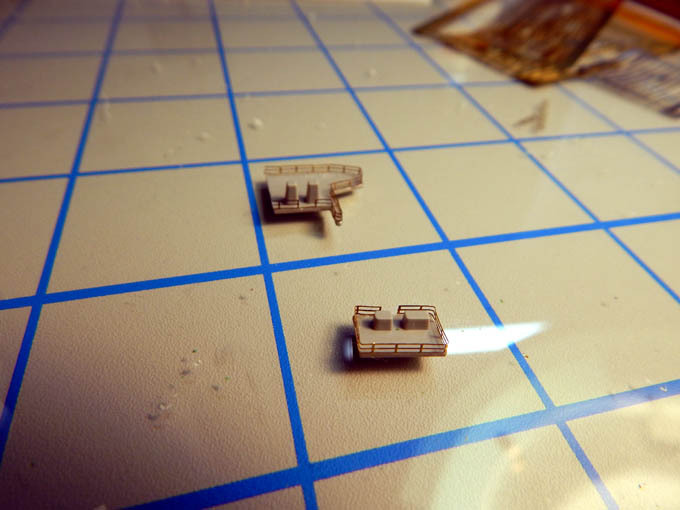 I drilled out the holes and used wire for the bezels. The sponsons were attached and detailed then fitted with the CIWS. 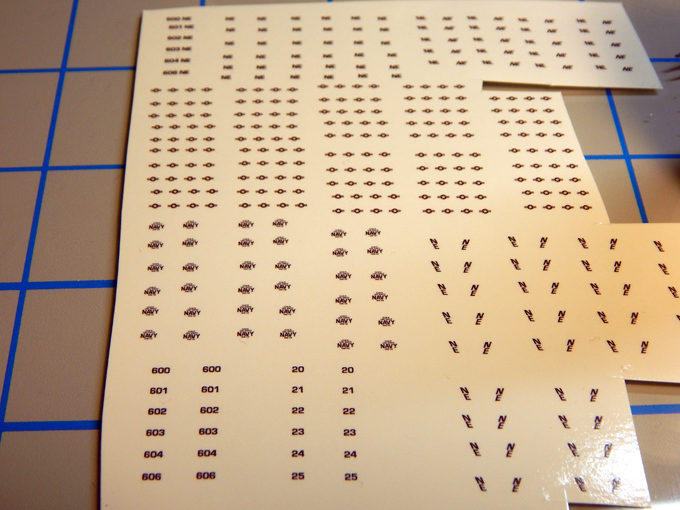 I made safety stripe decals for the hangar bay entryways and the warning circles for the missile launchers. 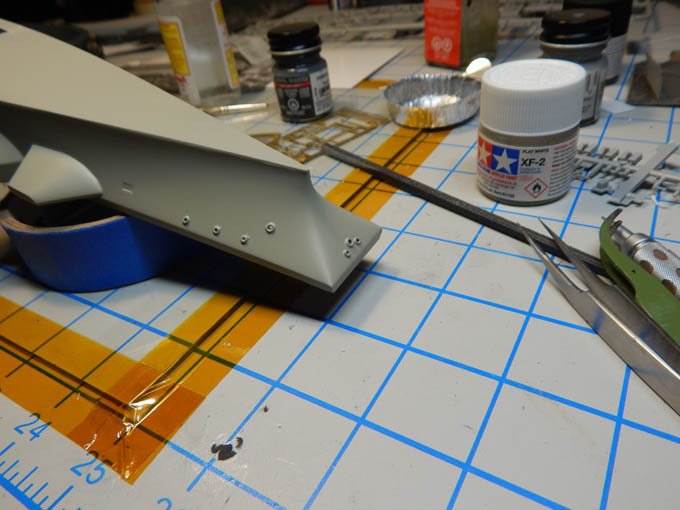 I then detailed the aft crane and mounted it. I have some more decals to do once they arrive early next week. 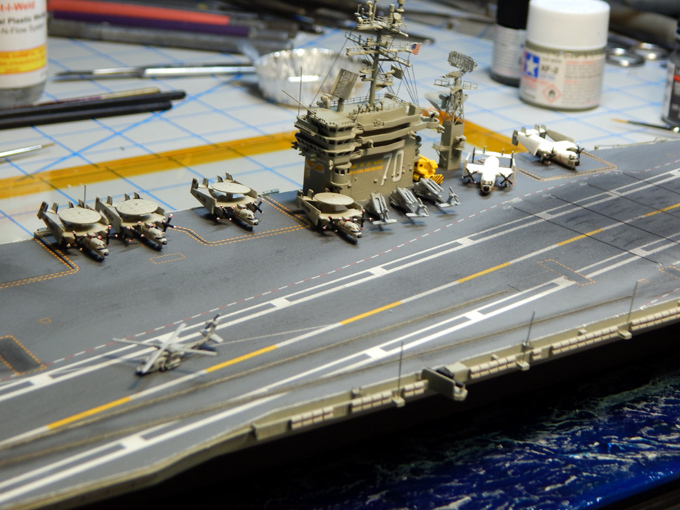 Starting to work on the flight deck now. 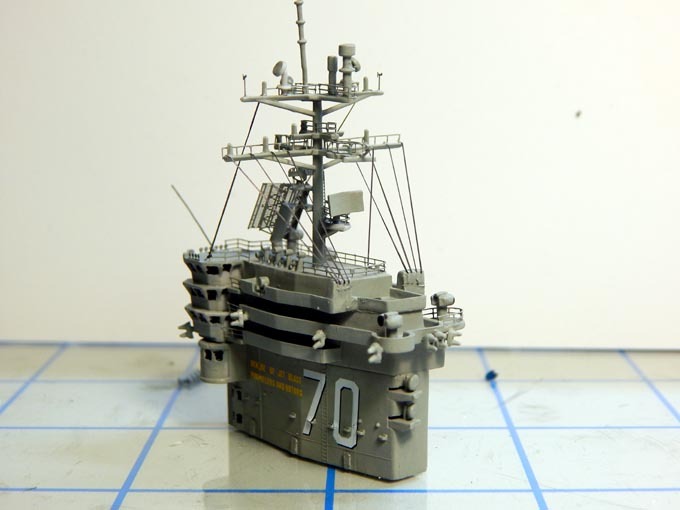 The construction of the Italeri 1/720 CVN-70 continues. 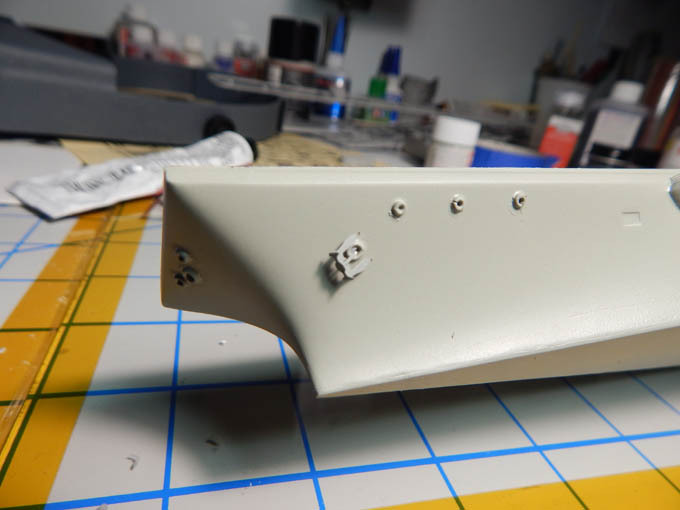 The hull has been completed and mounted to the base. 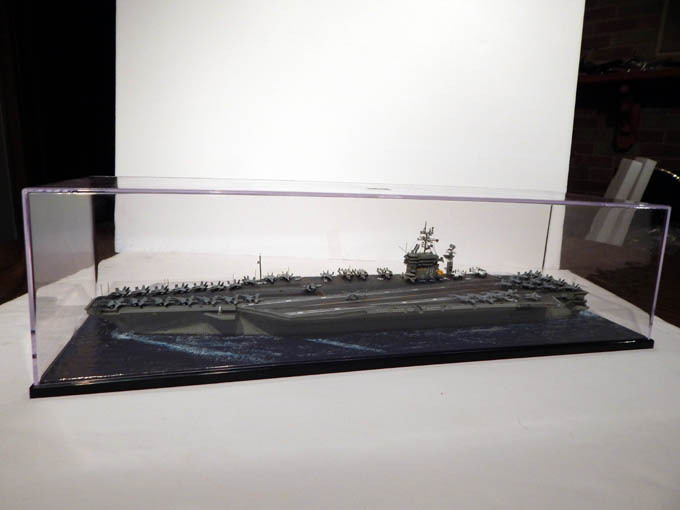 I used Liquitex acrylic gel to simulate the ship at sea. The base was painted blue with some green spots. The acrylic gel was applied and shaped for the wake and waves. 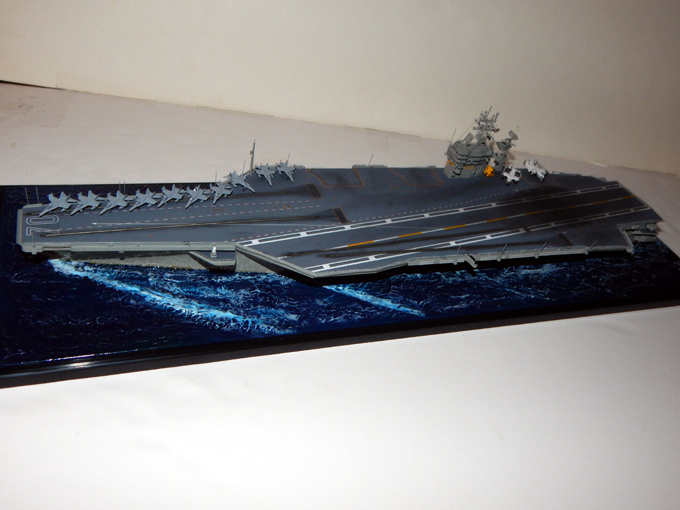 The entire surface was then painted with Tamiya clear blue. The white was then dry brushed and the crests were highlighted. I then brushed thinner over the surface to blend the blue and white slightly. 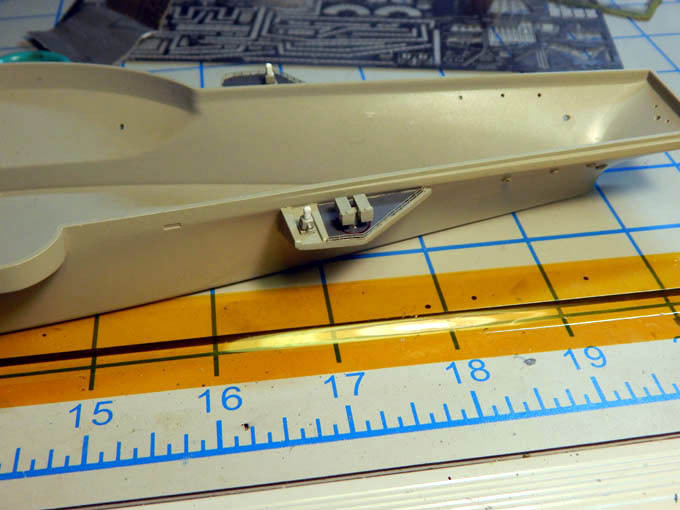 Turning my attention to the flight deck, I removed the molded in arresting cables as they looked more like walls. It was then painted and weathered. 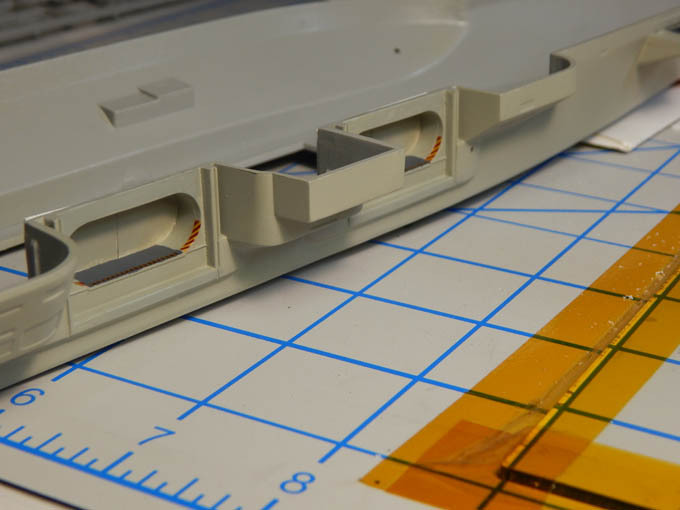 I then used EZ-Line thin for the cables. Still need to detail the catwalks and safety netting. I am working on the island and the mast now with details. The ship is close to being done then on to the air wing. 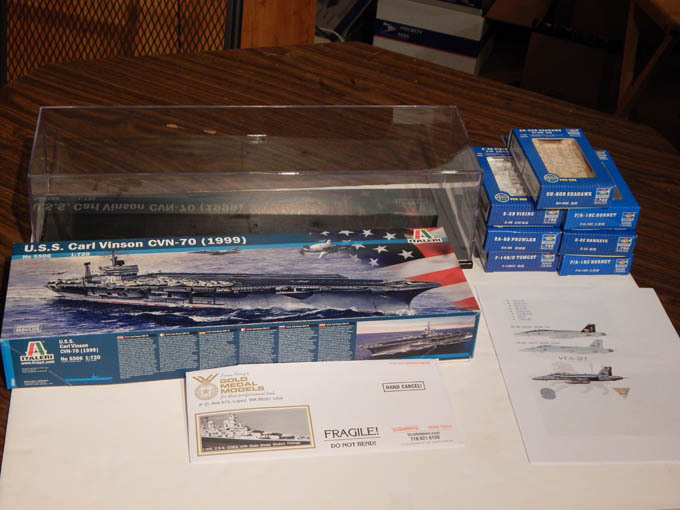 Moving forward on the Italeri 1/720 USS Carl Vinson I was able to finish the ship itself. I replaced the kit tower with the photo etch version, completed and rigged the island, and installed the rest of the parts on the ship. 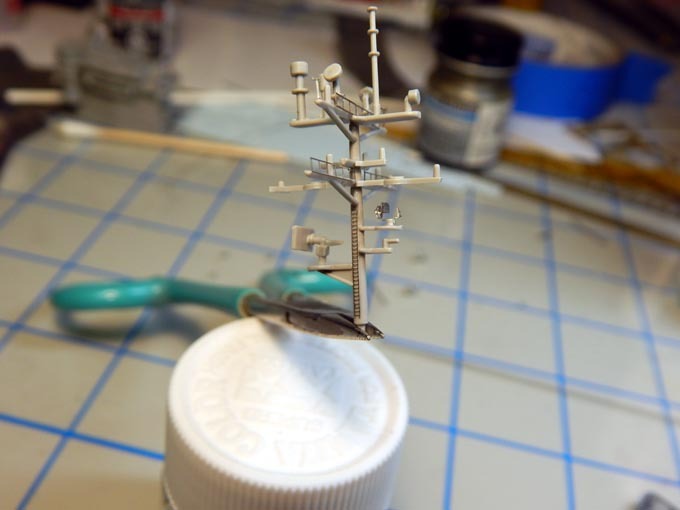 I also scratchbuilt the forward mast. 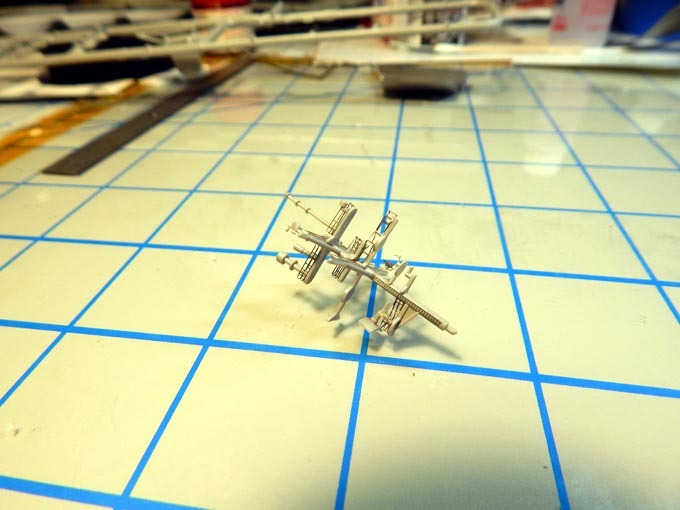 I am now working on the air wing. 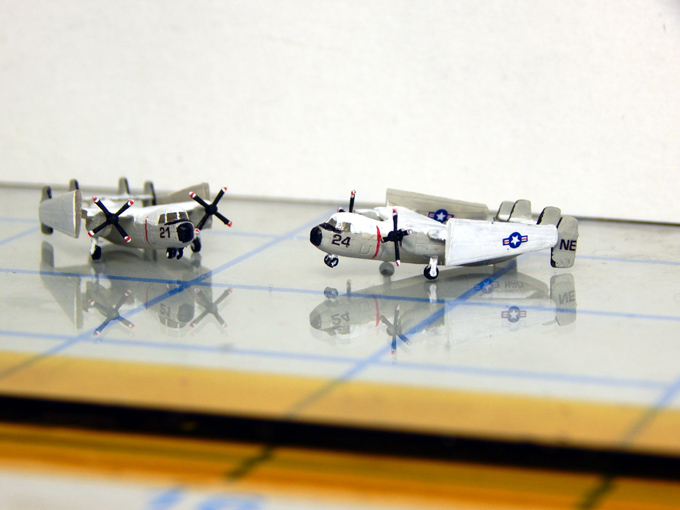 The kit aircraft lack a lot of detail so I am using the Trumpeter aircraft. 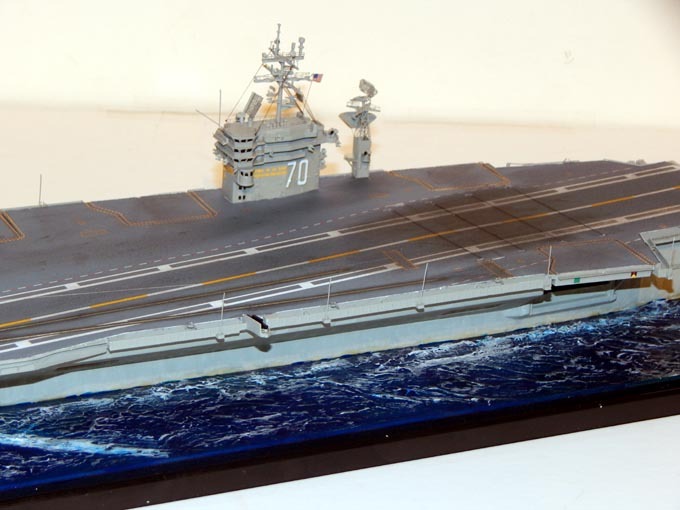 I will be building and detailing F/A-18’s (a few squadrons), E-2C’s, SH-60’s, and C-2’s to fill the flight deck. The kit crash crane looks fine and has been detailed. The 2 deck tractors that came with the kit are pretty sad looking. I ordered new 3-D printed deck tractors from Baconfist on shapeways. 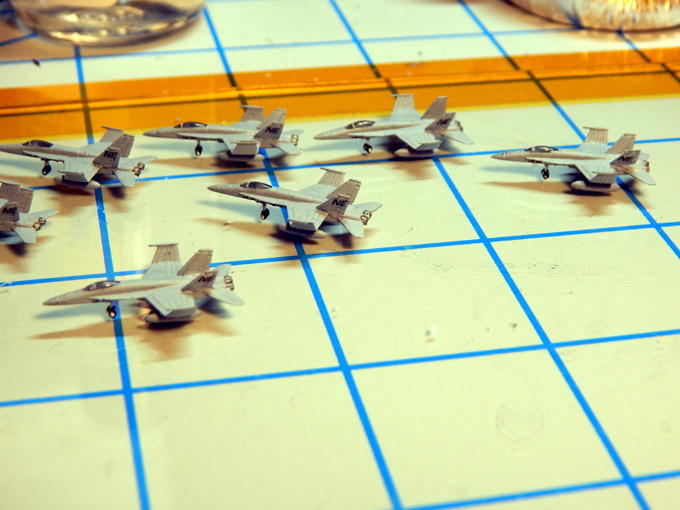 They should be here in about 8 days which gives me time to build detail the 30+ aircraft. 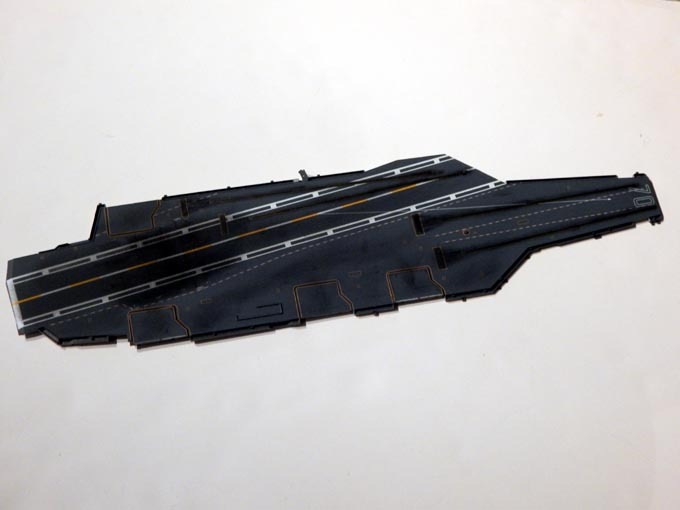 The air wing is now being built up for the 1/720 Italeri USS Carl Vinson. 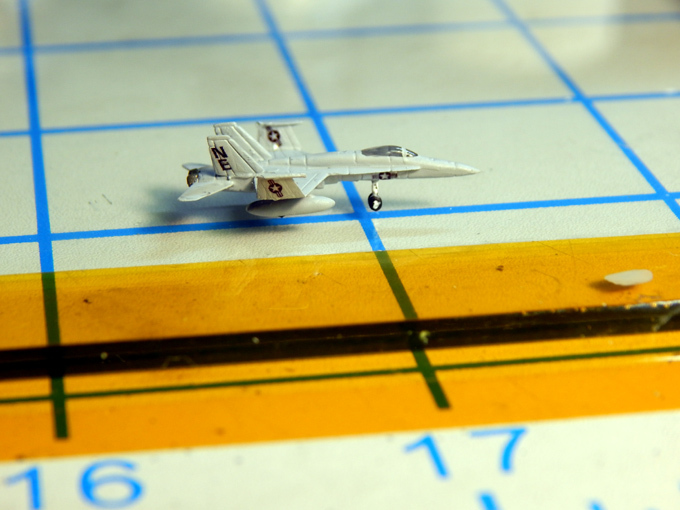 I have completed the F/A-18C’s for VFA-34 and the C-2’s for VRC-30. The aircraft kits come with minimal decals so I made some extra decals to include the tail code for CVW-2 and the numbers for the E-2’s and C-2’s. Having issues with getting the deck gear. Ordered them from Shapeways but received a notice from UPS that the package was damaged in transit. Not sure what the damage is but I emailed Shapeways and they are working the issue. Hopefully the replacements will be sent soon. So while I wait I am moving forward with the aircraft. 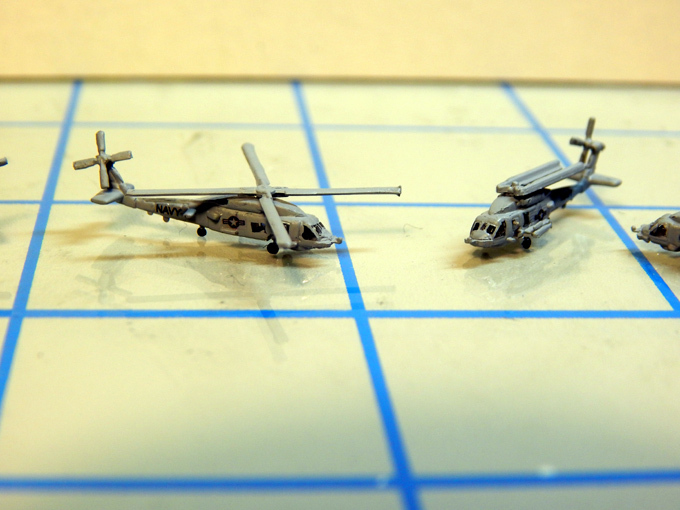 Next are the SH-60’s of HSC-4. 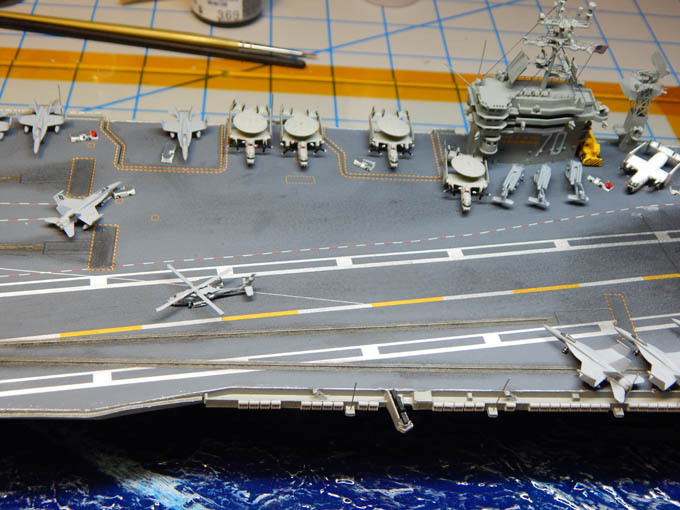 The building of the Italeri 1/720 CVN-70 air wing continues. 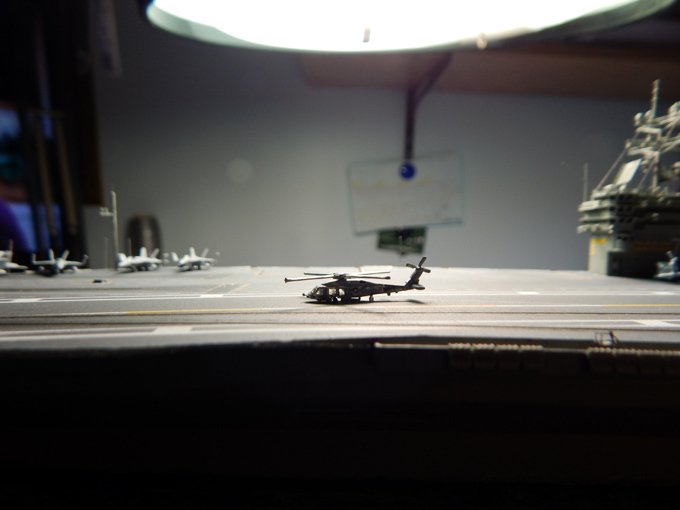 I have the SH-60’s, E-2C’s, and the F/A-18C’s completed. 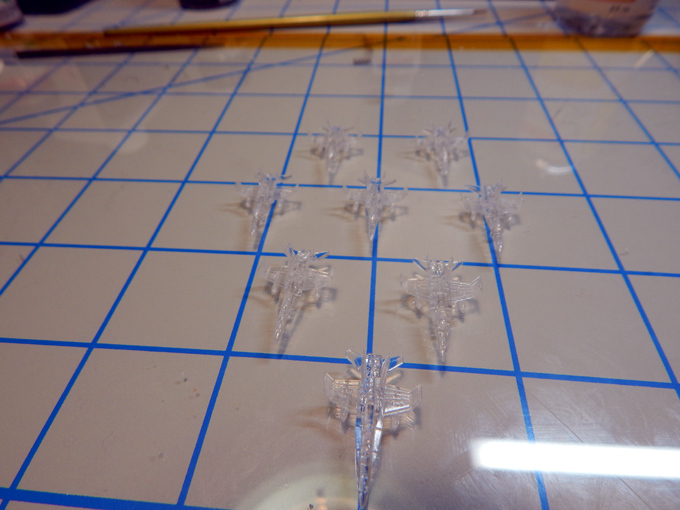 I like that Trumpeter molded the aircraft in clear but it does make them difficult to see while building. The photo of the SH-60 on deck looks great with the light showing thru. 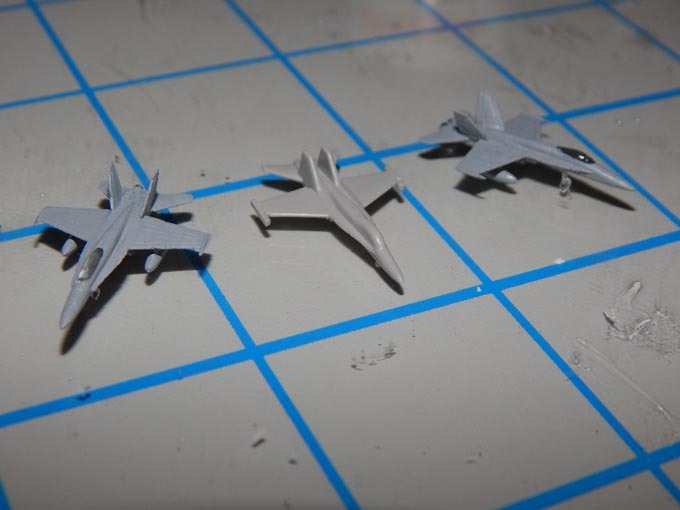 The F/A-18's unpainted look like a squadron of aircraft from Paradise Island (think Wonder Woman LOL) I still have the F/A-18E’s and the deck tractors to complete. 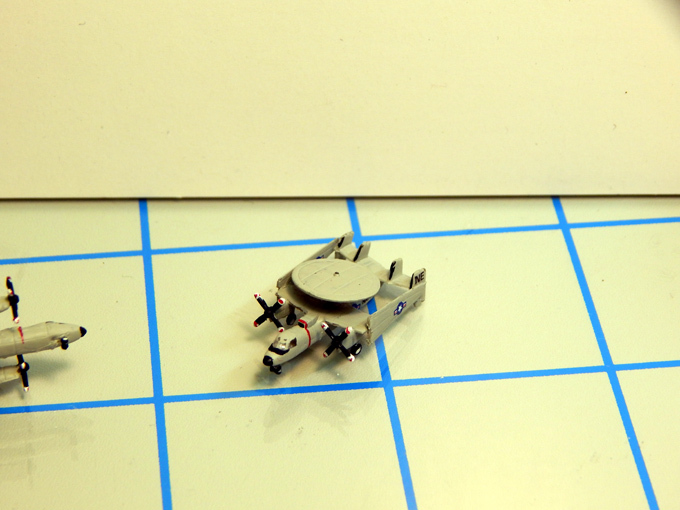 The first order of the Shapeways 3-D printed deck tractors somehow were damaged during shipping. Did not see the damage as the shipper just sent an email. 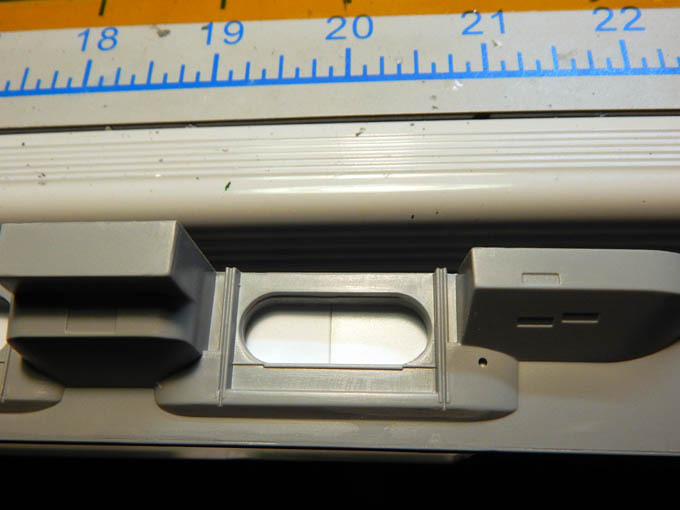 I contacted Shapeways and they contacted the shipper then sent a replacement set which arrived in perfect condition. They have awesome customer service! Should have this project completed by the end of next week. Wow that looks fantastic. Your airwing is really cool. Really nice job - love the deck weathering. 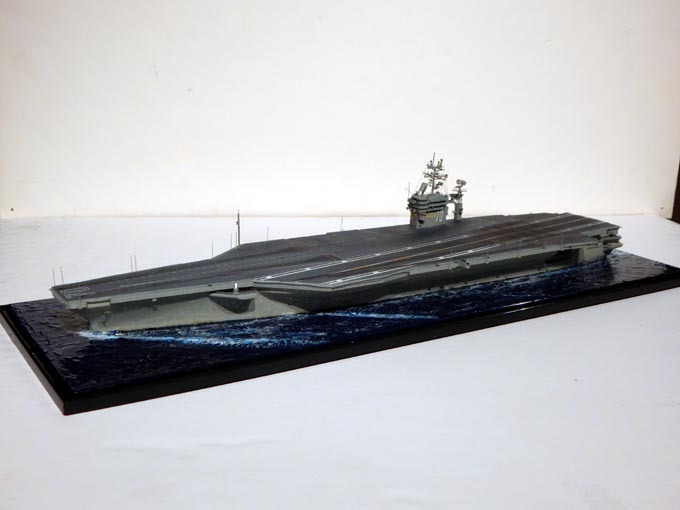 The Italeri 1/720 USS Carl Vinson and air wing are now complete! All that is left to do is to mount the nameplate on to the base. The engraved nameplate is due to arrive tomorrow. Will be shipping this out to the client early in the week. Overall the Italeri model is about average. 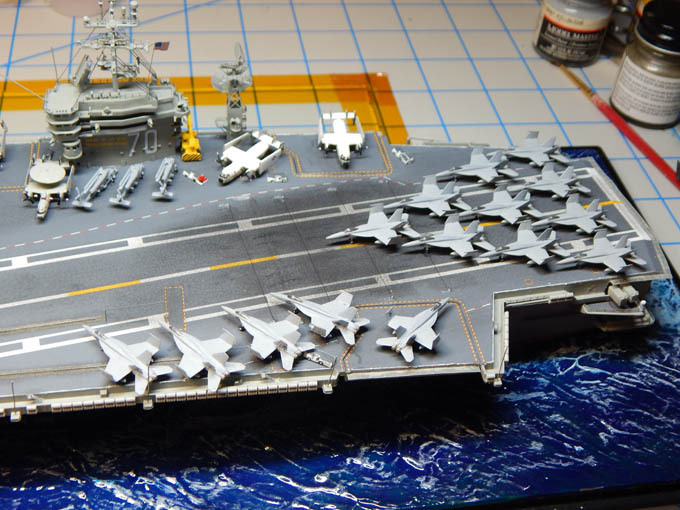 If you plan on building one of these I recommend the photo etch set and Trumpeter aircraft to bring out the details at this scale. Now on to the photos.